Betties N Brimstone: A Most Metal Birth Announcement. This week, I sent out our official birth announcement to our friends and family. 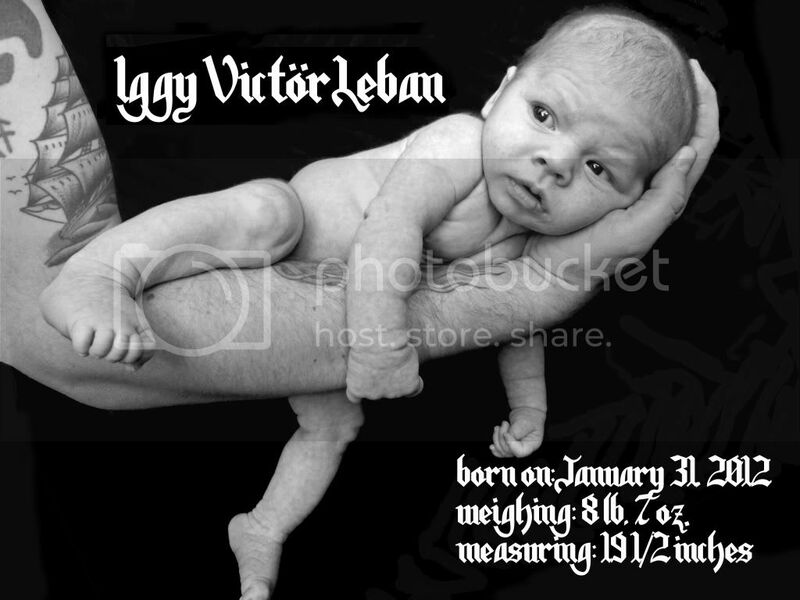 I was really excited to do this, since I had been planning since before Iggy was born (hey, I had a lot of time to sit around and think, right?!). I wanted something that was a little left-of-center... I appreciate the cute announcements where you simply plug in your own baby photos on Snapfish, or have the hospital photo shoot people create theirs for you, but it just isn't us. I knew I wanted black and white, high contrast, with a heavy metal bent. I should probably take a moment here to mention how horrible most baby "rock and roll" themed stuff is... outfits that say "mommy's little rockstar" or have cheesy cutesy guitar clip art images emblazoned on them... ew. Have you noticed that? I sure have. So I usually have to go someplace completely different for ideas, or customize my own junk. The layout for his announcement was similar to one that I found online, but we took our own photo (which I later modified and added layout via photoshop) and then used the Motorhead font for the lettering. Notice we even added an umlaut above the "o" in Victor - a definite nod to Motorhead for those who know! I actually did use Snapfish or the printing. You can make cards where the photo fills the whole card, so the image you see above is one photo file, printed from edge to edge on a card. I found a great discount code and snagged the final cards with envelopes (I ordered 120 of them) for just under $1 each! Yippee!